Ashley Ann Varughese SUT Academy of Medical Sciences Vencode PO, Vattapara, Thiruvananthapuram – 695028 Kerala, India. Interpretation of prostate lesions in TURP and needle biopsies have always been a challenge due to their varied presentation. PSA, produced by epithelial cells of all types of prostatic tissue, is the key factor for screening and detection of prostate cancer. The present study aimed to analyze the histopathological changes of prostate and correlate them with PSA levels. Methods: One hundred and twenty cases of prostate lesions were obtained in two years. H&E stained sections were examined and a histopathological diagnosis was given. Result: Out of the 120 cases, 92 (76.7%) were Benign Prostatic Hyperplasia (BPH), 9 (7.5%) were Prostatic Intraepithelial Neoplasia (PIN) and 19 (15.8%) were Prostate Carcinoma (PCa). All three lesions presented predominantly with obstructive lower urinary tract symptoms. In the BPH group, mean age was 66 years and mean PSA of 7.21ng/mL. In the PIN group, majority were low grade PIN (77.8%), mean age of 66.56 years and mean PSA 38.23ng/mL. The highest PSA obtained in this study was 199ng/mL in a case of low grade PIN. In the Prostate carcinoma group, mean age was 66 years, mean PSA 63.8 ng/mL, majority were conventional adenocarcinomas (94.7 %). Most of the carcinomas had a Gleason sum < 6 and were well differentiated tumours (52.6%). Conclusion: All three groups had a common mean age of presentation and serum PSA levels were not always conclusive of the concerned pathology. Therefore, prostate lesions should be thoroughly evaluated by histopathology keeping in mind their neoplastic potential. Ashley Ann Varughese, SUT Academy of Medical Sciences Vencode PO, Vattapara, Thiruvananthapuram – 695028 Kerala, India. 1. Bostwick DG, Amin MB. Prostate and seminal vesicles. In: Damjanov I, Linder J, editors. Anderson’s Pathology. Diseases of the urogenital and reproductive systems. 2. 10th ed 2006. p. 2197 – 230. 2. Ayala AG, Ro JY. Prostatic intraepithelial neoplasia Recent advances. Arch Pathol lab Med. 2007;131. 3. Epstein JI, Netto GJ. Clinical correlates with biopsy: Serum prostate-specific antigen, digital rectal examination, and imaging techniques. In: Epstein J I, Netto G J (eds) : Biopsy interpretation of the prostate. Philadelphia, Lippincott Williams and wilkins, 2007 pp 2-5. 4. Shirish C, Jadhav PS, Anwekar SC, Kumar H, Buch AC, Chaudhari US. Clinico-pathological study of benign & malignant lesions of prostate. IJPBS. 2013;3(1):162-78. 5. Roehrborn CG. Benign prostatic hyperplasia : An overview. Reviews in Urology. 2005;7. 6. Herawi M, Epstein J. Specialised stromal tumors of the prostate: A clinicopathologic study of 50 cases. Am J Surg Pathol 2006;30(6):694-704. 7. Khan M, Khan A, Khan S, Nawaz H. Benign prostatic hyperplasia: mode of presentation and postoperative outcome. J Pak Med Assoc. 2005;55(1):20-3. 8. Lee JG, Bae SH, Choi SH, Kwon TG, Kim T-H. Role of Prostate-Specific Antigen Change Ratio at Initial Biopsy as a Novel Decision-Making Marker for repeat Prostate Biopsy. Korean J Urol. 2012;53:467. 9. Lakhey M, Ghimire R, Shrestha R, Bhatta A. Correlation of serum free prostate-specific antigen level with histological findings in patients with prostatic disease. Kathmandu University Medical Journal 2010;8(30):158-63. 10. Bostwick DG, Cheng L. Precursors of prostate cancer. Histopathology. 2012;60:4-27. 11. Bostwick DG, Qian J. High grade prostatic intraepithelial neoplasia. Modern Pathology 2004;`7:360-79. 12. Sánchez-Chapado M, Olmedilla G, Cabeza M, Donat E, Ruiz A. Prevalence of prostate cancer and prostatic intraepithelial neoplasia in Caucasian Mediterranean males: An autopsy study. The Prostate. 2003;54(3):238-47. 13. Bostwick DG, Pacelli A, Lopez-Beltran A. Molecular biology of prostatic intraepithelial neoplasia. The Prostate. 1996; 29:117-34. 14. Epstein JI, Netto GJ. Clinical correlates with biopsy: Serum prostate-specific antigen, digital rectal examination, and imaging techniques. In: Epstein J I, Netto G J (eds) : Biopsy interpretation of the prostate. Philadelphia, Lippincott Williams and wilkins, 2007 pp 2-5. 15. Zeigler-Johnson CM, Rennert H, Mittal RD, Jallo M, Sachdeva R, Malkowicz SB, et al. Evaluation of prostate cancer characteristics in four populations worldwide. Can J Urol. 2008;15(3):4056-64. 16. Ojewola R, TIjanu K, Jeje E, Anunobi C, Ogunjimi M, Ezenwa E, et al. Is extended biopsy protocol justified in all patients with suspected prostate cancer?. Nigerian Journal of Clinical Practice 2012;15(3):315-9. 17. Pourmand G, Allameh F, Mohammed K, Dehghani S, Pourmand B, Mehrsai A, et al. Prostate cancer predicting factors: A Preliminary report from Tehran. Urology Journal. 2012;9(4):667-72. 18. Hsing AW, Sakoda LC, Jr SCC. Obesity, metabolic syndrome and prostate cancer. Am J Clin Nutr 2007;86:843S-8457S. 19. Sapira MK, Onwuchekwa AC, Onwuchekwa CR. Comorbid medical conditions and medical complications of Prostate Cancer in Southern Nigeria. Med J Malaysia. 2012;67(4):412-6. 20. Zhu Y-P, Ye D-W, Yao X-D, Zhang S-L, Dai B, Zhang H-L, et al. Prevalence of incidental prostate cancer in patients undergoing radical cystoprostatetectomy: data from China and other Asian countries. Asian Journal of Andrology. 2009;11:104-8. 21. Zare-Mirzaie A, Balvayeh P, Imamhadi MA, Lotfi M. The frequency of latent prostate carcinoma in autopsies of over 50 years old males, the Iranian experience. Medical Journal of Islamic Republic of Iran. 2012;26(2):73-7. 22. Oranusi C, Ugezu A, Nwofor A. Diagnosis of prostate cancer with needle biopsy: Should all cases be biopsied before treatment? Nigerian Journal of Clinical Practice 2012;15(1):48-50. 23. Arneth BM. Clinical significance of measuring prostate-specific antigen. 2009; 40: [487-91 pp.]. Available from: labmed.ascpjournals.org/content/40/8/487.full. 24. Epstein JI, Netto GJ. 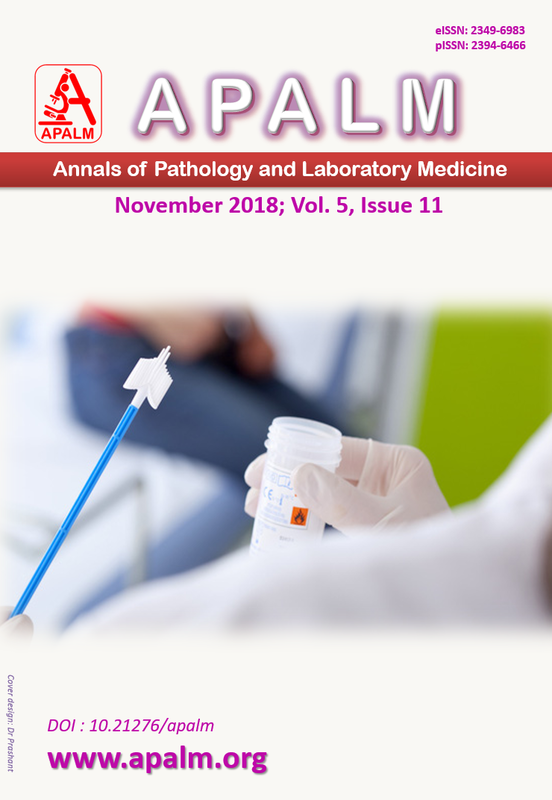 Clinical Correlates with Biopsy: Serum Prostate Specific Antigen, Digital rectal examination and Imaging techniques. Biopsy Interpretation of the Prostate. 4th ed. Baltimoore: Lippincott Williams and Wilkins; 2008. p. 2-5. 25. Zivkovic S. Correlation between prostate-specific antigen and histopathological difference of prostate carcinoma. Arch Oncol 2004;12(3):148-51. 26. Divrik RT, Eroglu A, Sahin A, Zorlu F, Ozen H. Increasing the number of biopsies increases the concordance of Gleason scores of needle biopsies and prostatectomy specimens. Urologic Oncology: Seminars and Original Investigations 2007;25:376-82. 27. Osunkoya AO. Update on Prostate Pathology. Pathology. 2012;44(5):391-406. 28. Khang IH, Kim YB, Yang SO, Lee JK, Jung TY. Differences in Postoperative Pathological Outcomes between Prostate Cancers Diagnosed at Initial and Repeat biopsy. Korean J Urol. 2012;53:531-5. 29. Grignon DJ. Unusual subtypes of prostate cancer. Modern Pathology. 2004;17:316-27. 30. Tavora F, Epstein JI. High grade prostatic intraepithelial neoplasia like ductal adenocarcinoma of the prostate: a clinicopathologic study of 28 cases. Am J Surg Pathol 2008;32(7):1060-7.